I woke up our last full day in Washington, D.C. not feeling very well. I knew we were going to have a late night of work and the chance of getting dinner before midnight was pretty slim. I knew I had to find something to eat but I didn’t know what. My co-worker took the morning to go do some sightseeing. I chose to sleep in and it’s a choice I don’t regret. One of these days I’ll get back to DC to do the sightseeing thing. We were in town to work and we were working long hours so I took advantage of the late start on Sunday. I crawled out of bed around 11:00 and took a shower hoping that would help me feel better. It didn’t. I thought maybe if I ate that would help. As I’ve mentioned in a few of my other blog posts, there really wasn’t any walk up counter service places around where I was staying. I expanded my search a little bit thinking a walk would do me good and I finally found a recognizable place that I don’t get very many opportunities to eat at. 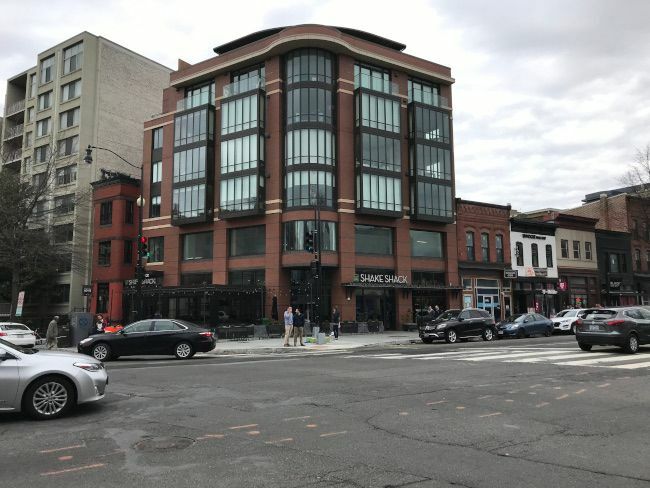 Shake Shack has multiple locations in the DC area, but the closest one to me was the Logan Circle location on the corner of 14th Street and Rhode Island Avenue. The restaurant takes up space on the ground floor of a pretty new looking mixed-use building on a very busy corner with a number of shops and other restaurants. My only experience with Shake Shack was a quick visit to the Michigan Avenue location in downtown Chicago before we went to see Hamilton. 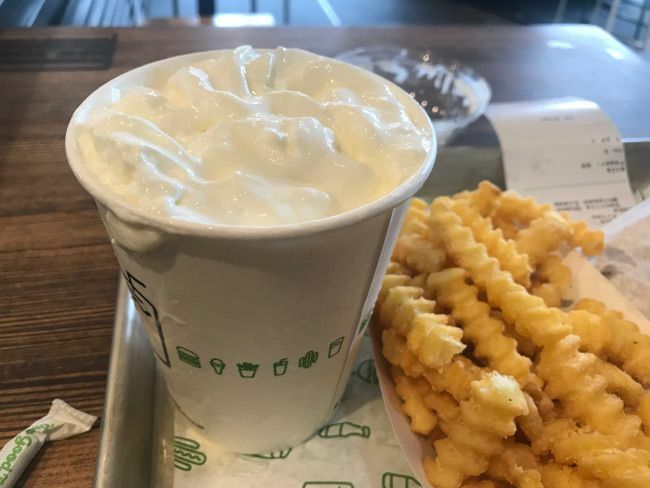 We had already eaten a full meal at a different restaurant but I forced myself to eat another since it was the first time I had ever set foot in a Shake Shack. 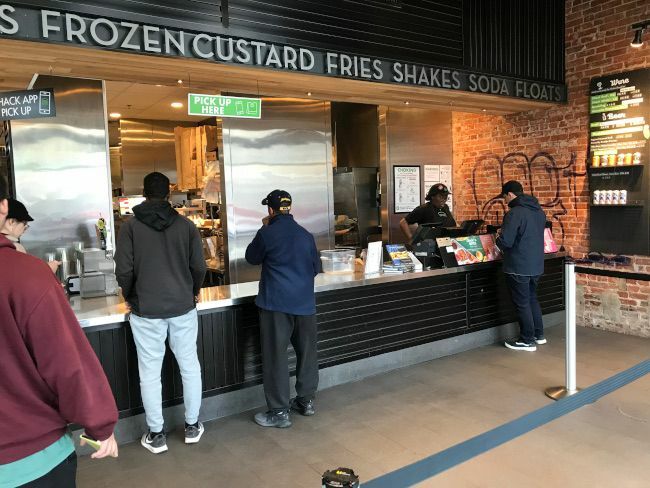 Shake Shack is essentially a fast food restaurant although I’m sure they prefer the term “fast casual.” There’s an order counter just inside the door with the menu printed on the wall perpendicular to the cash registers. I still needed a little bit of time to look it over and there as no one in front of me or behind me so I had as much time as I needed. I wanted a little bit of everything so I ordered a SmokeShake, an order of fries, and a vanilla milkshake. The tab was just a little over $20. I was given a buzzer which would go off a little over 10 minutes later to let me know my food was ready. The SmokeShack is a pretty interesting burger. 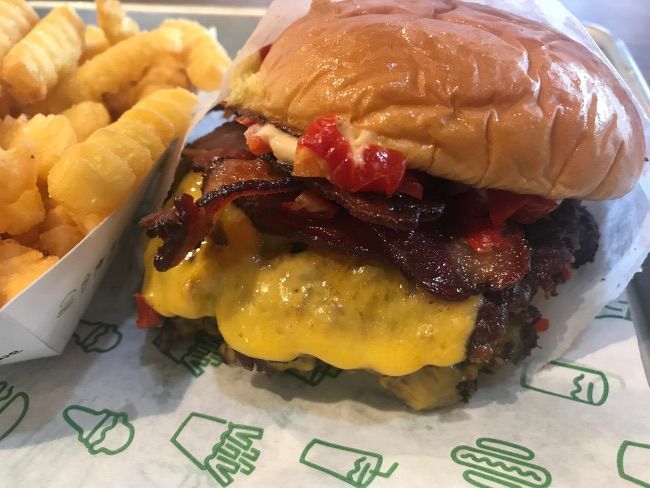 I picked it as a double cheeseburger and it’s topped with applewood smoked bacon, chopped cherry peppers, and Shack Sauce. The chopped cherry peppers were kind of awesome. They added some crunch and some heat to the burger. The Shack Sauce is a mayo based sauce that’s a little sweet, a little hot, and a little sour. The best thing is they don’t over do it. There’s a thin layer of the sauce on the bun and that’s about it. It mixes with the cherry peppers perfectly. The meat used is 100% angus beef that’s hormone and antibiotic free. The sandwich is served on a Martin’s potato roll which is nice and soft and just kind of soaks up all the flavors. The fries totally underwhelming. They’re nothing but simple, frozen, crinkle cut potatoes. They’re a typical fast food side that needs some kind of dipping sauce. I picked a vanilla milkshake over another Coke because, it’s Shake Shack so why the hell not. The shake is on the smaller side but it’s dense, rich vanilla shake. I had it topped with whipped cream which I didn’t realize was extra or I wouldn’t have done so. It’s the kind of shake that’s a little too thick for a straw but not thick enough for a spoon. The best way to tackle it is just by picking the cup up and drinking it. 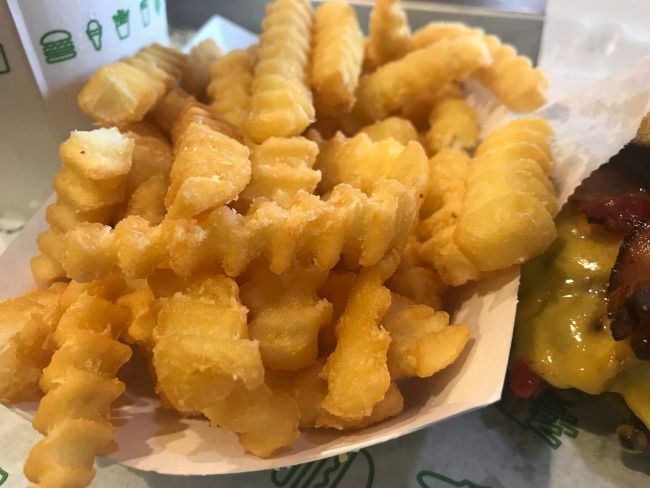 Shake Shack is one of those elusive chain restaurants that you kind of go out of your way for until you get one in your hometown. We don’t have any in West Michigan (yet). There are locations in both Troy and Detroit but that’s the only two in Michigan. Shake Shack always comes up with the likes of In-n-Out, Whataburger, Five Guys, and other higher end burger chains. If there was one down the street, would I get as excited about it? Probably not but I would eat there often. As it is now, my eyes light up every time I see the Shake Shack sign. We had Shake Shack in DC at Union Station a couple of years ago. 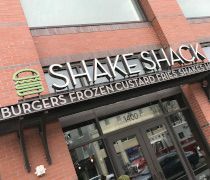 I think you hit the nail on the head: their burgers are pretty good and IMHO hang right there with In n’ Out and Five Guys, but the fries and rest of the stuff is underwhelming.